The Download Sort add-on for Firefox can automatically save your downloads to various folders based on rules you define. This freebie might take a bit of work to set up, but once you've got it rolling your downloads will sort themselves right into place. Firefox add-on Download Sort lets you designate where to place downloads of a given type. Download Sort comes into play only when you right-click a file and choose "Save Link As..." or "Save Image As...". Download Sort won't change how Firefox acts when you left-click a file. 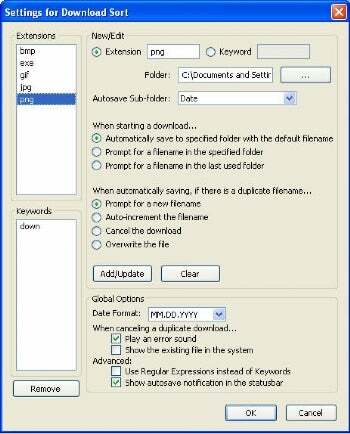 Each rule can be based on a particular file extension, such as .exe or .jpg, or a keyword found in the file's name. You can also choose to automatically sort into sub-folders based on a download's extension, date of download, or other information. For example, you can create a folder named "Firefox Downloads," and then have all your downloads save to sub-folders in that directory based on their extensions. Additional options in Download Sort allow for deciding how to handle duplicate filenames, using regular expressions instead of keywords, and showing a message in the status bar when the add-on is doing its job. Although Download Sort can be a timesaver after it's all set up, you'll first have to create distinct rules for every file extension or keyword you want handled. It would be smoother to create one rule that could work for any image file, for example. But if you often find yourself sifting through a mess of files in your downloads folder, Download Sort can help you organize.